Hello and welcome to the Paper and Such blog hop! If you arrived here from Jacquie's Blog you are right on track. I have a complete blog hop list at the end of this post if you get lost along the way. Today is release day! You can check out the new set in the the Paper and Such store. Make sure to comment along the way because one random commenter from one of the blogs will win this set. Beautiful, Janice! Your butterflies look like they've alighted from a piece of fine lace! Love the texture and the lace ribbon and bow! Hugs my friend! Ooh la la, that is a beauty! 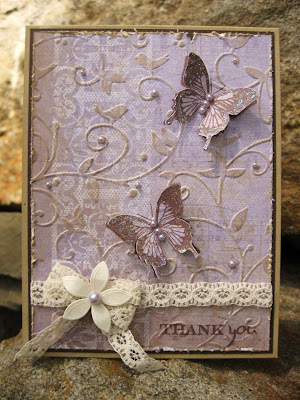 I especially love the muted tones on the embossing. Just gorgeous Janice!!! And even more beautiful in person! love all of the embossing with the butterflies! Gorgeous! I love the texture and vintage feel. 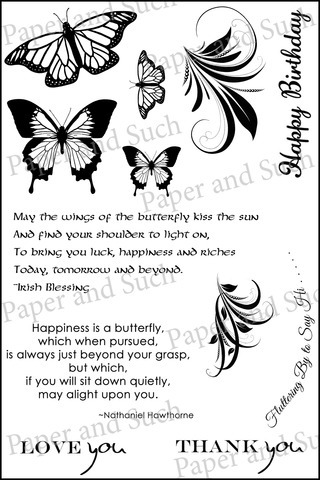 Love the embossing folder you used with the pretty butterfly image.